Spaces and structures are never static. Fluid and protean like humans, nature and food, they change and metamorphose with the seasons. Spaces open up to sunlight and embrace shadows, air and a fresh outlook and ambience. Shibuya’s TRUNK(KITCHEN), part of the TRUNK(HOTEL) complex situated between Shibuya and Harajuku, is a subtle and cozy dining space which offers an array of seating options — inside the main restaurant, the intimate chef’s table and on the open patio overlooking the beautifully tranquil terrace. 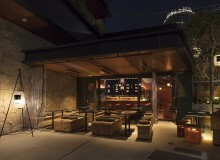 Refined yet casual the restaurant is a much-needed alternative in the Tokyo culinary scene. 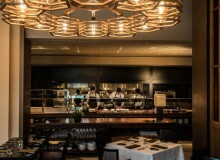 TRUNK(KITCHEN) is a restaurant very much in tune with seasonal produce and the restaurant’s new spring menu reflects this with its signature sophistication. Head chef Masashi Okamoto, who has experience working in France, has brought European tastes to Tokyo in order to create a neo-Japanese bistro with classical and fresh, seasonal food. 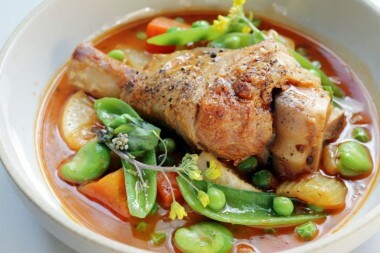 On the menu for spring are some full-bodied dishes which fuse French and Asian cuisine with Japanese produce such as teriyaki Tokyo X with sichuan pepper and kushinsai (water morning glory) and a glorious lamb tomato stew which is inspired by the French spring dish navarin but with Japanese local vegetables. 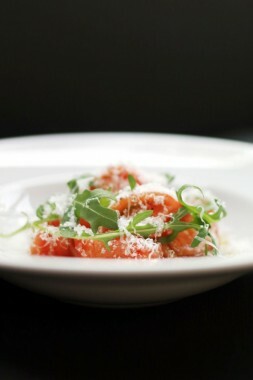 Another simpler dish is the fruit tomato, rocket and parmigiano salad which encapsulates the essence of spring in one plate. It’s a quintessentially European dish but the ingredients are all locally sourced which enhances the delicate harmony between European and Japanese cuisine. Okamoto is keen to stress the dichotomous flavors of bitterness and sweetness in the new menu. Spring is a complex season when we say our goodbyes to winter and the holidays and subsume the fresh warmth and delicateness of spring. Some may say sayonara to a school, college or job in order to move on to pastures new so the flavors of bitterness and sweetness encapsulate this fundamental paradox. 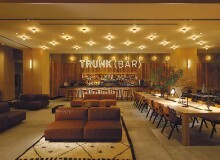 TRUNK(KITCHEN) also offers an array of menus which embody the restaurant’s ethos of local, diversity and health. 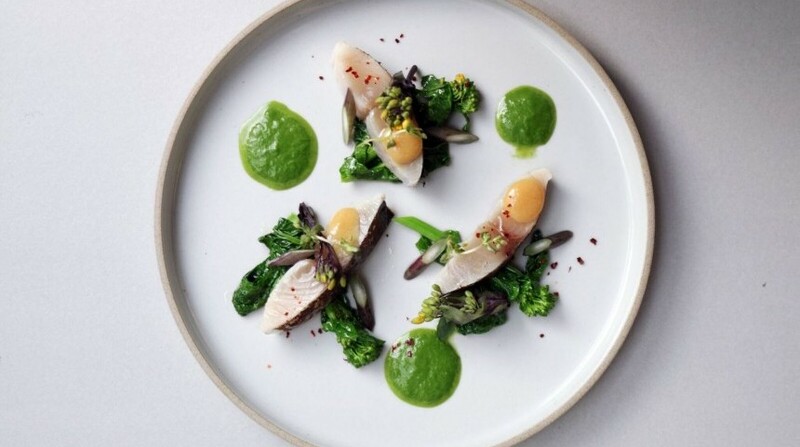 The House Course which focuses on health includes dishes such as kale and avocado tacos and the aforementioned fruit tomato, rocket and parmigiano salad while the Dining Course favors diversity with some showstoppers including dry-aged sirloin with truffle sauce. 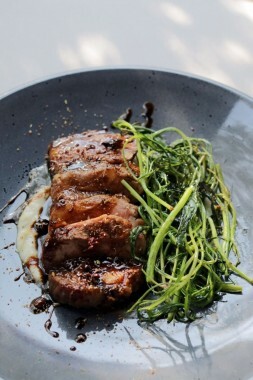 The Living Course, however, targets the local first philosophy and includes fusion dishes like swordfish meuniere with edo miso and a dessert of Shibuya Honey and Fukagawa Wine. The restaurant also offers a spectrum of natural wines to accompany the dishes with a sommelier on hand to assist customers with informed recommendations. TRUNK(KITCHEN) encourages foreign guests to come and try chef Okamoto and his talented team’s subtle twist on Japanese cuisine which has been tailored towards foreign tastes. Naturally the restaurant can cater for customers with allergy, gluten free and vegetarian requirements. Serving breakfast, brunch, lunch and dinner TRUNK(KITCHEN) is ostensibly a restaurant for everyone — from single diners and couples to families and groups. It’s an idyllic oasis in the center of Tokyo and a destination to remember no matter the season. TRUNK(KITCHEN). 5-31 Jingumae, Shibuya-ku, Tokyo. Tel: 03-5766-3202.